If you've lived in North Carolina for long, you're probably familiar with muscadine grapes. They're the large, round, think-skinned fruits that are often transformed into sweet wines and jellies. They're "the grape of choice in the South," according to Terry Pulley, owner of Granny Pearl's Farm, which offers you-pick muscadines and scuppernongs in Zebulon. But did you know that muscadines are antioxidant powerhouses, surpassing even nutritional superstars like blueberries and pomegranates in their antioxidant content? According to Ashley Cobb, clinical dietician at WakeMed, muscadines are especially high in the antioxidants resveratrol and ellagic acid. Sound familiar? Resveratrol is the antioxidant that is responsible for red wine's heart-healthy reputation, and Cobb says that the mighty muscadine has nine times more antioxidant power than the red grapes used to make California's red wines. They also contain six times the fiber, and muscadine wines may contain three to four times the amount of phenolic compounds (which have antioxidant properties), plus a higher ellagic acid content than your average red wine. "Resveratrol helps to decrease cholesterol fight cancer, and some newer studies show that it may reduce the risk of age-related diseases such as Alzheimer's, cardiovascular disease, high-blood pressure, Crohn's, Parkinson's, and more, and ultimately may lengthen one's lifespan," said Cobb. "Ellagic acid is another type of antioxidant that is being investigated in cancer prevention research"
And while the antioxidant power of the muscadine is pretty impressive, that's not the only nutritional positive these fruits have going for them. "Muscadines are also fat-free, high in fiber, low in sodium and an excellent source of manganese - they're a perfect addition to a healthy diet!" said Cobb. That is some serious nutritional power! But before you run out to grab some muscadines, Cobb notes that to get the full nutritional benefits, you should really eat the skin. "Growing up, I used to spit the skin out because is was thick and slightly bitter, but you lose out on so many of the nutritional benefits this way! I would encourage consumers to eat the skin - it gives the grape some variety in texture and a mix of sour and sweet that is quite enjoyable." Pulley, at Granny Pearl's Farm, notes that certain varieties are better for certain methods of preparation, so be sure to choose the right variety for your needs. He said that many of his customers plan to freeze the muscadines for use in smoothies, or eat them raw, and he has a word of advice for those customers. "We encourage you taste before you pick," said Pulley. "Different varieties have different flavors, so you want to be sure you like that particular variety before you pick them." There are a few caveats about consuming muscadines, though. Cobb noted that because muscadines are higher in sugar content than your average red or green grapes, people with diabetes should keep an eye on their portion size. 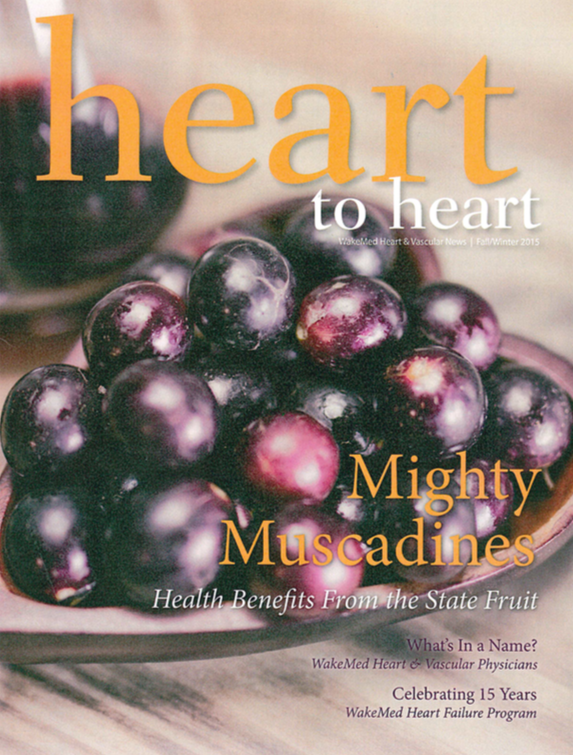 While the best way to eat muscadines is raw, there are ways to eat them prepared that maintain their nutritional value. One of the most common ways to use muscadines is to make a jam or jelly out of them. According to Jill Frank, who owns Windy Bottoms Farm in Mebane with her husband Jon, as long as the muscadines are fully ripe, low-sugar jelly or jam recipes work well. Frank recommends using a tried-and-true jelly or jam recipe, like the ones available from Ball Canning at www.freshpreserving.com. But she has a few tips specific to muscadines. When making jelly, the first step is to extract the juice of the grape, which can be a chore, said Frank. "To prep for making the jelly, each grape needs to have the hull (or skin) removed, or each grape need to be squeezed to make the seeds and pulp release," she said. "Since the skin is tough, this can be super time consuming, and I've found that using a knife to cut each ones works best." The grapes then are heated and mashed until they release their liquid and the fruit is strained for several hours. Then you can take the juice and follow the instructions on the jelly recipe. Beyond jams and jellies, one of the most popular ways to prepare muscadines is to turn them into wine. And while muscadine wines may seem like the perfect healthy indulgence, Cobb has a word of warning before you imbibe. "As with any alcoholic beverage, the health benefits exist for consuming muscadine wine in moderation. For women, this means no more than one, 5oz. serving of muscadine wine. For men, the limit is two servings of wine per day. Alcohol consumption in excess decreases the health benefits and can lead to other problems," noted Cobb. So, enjoy an occasional glass of muscadine wine, but remember that the biggest nutritional benefit will come from enjoying these tasty fruits in their pure, unprocessed form. Just remember to eat the skins! Click to view the full article here!